Huel is a truly disruptive food product, that has the ability to deliver all the nutrients required by the human body in powdered form. Introduced for the very first time in 2015, the powdered food is the brainchild of serial entrepreneur and fitness and nutrition enthusiast, Julian Hearn. The good news? It was launched by none other than yours truly, the Yeti clan. Julian approached the agency when he was first finalising the product and planning the launch, so we had the chance to get on board from the get go. 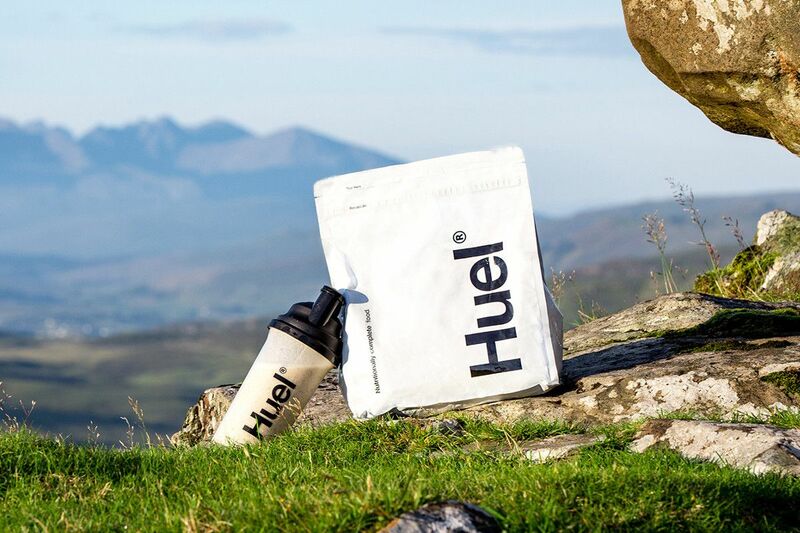 The brief was clear: the product was going to disrupt the market, so all we had to do was communicate just how much of a game changer Huel could be. We certainly weren’t lacking in a news hook. The UK had never seen anything like Huel before; there was no need to search high and low for a USP. The main challenge was communicating the scale of what Julian was proposing here – while it could supplement a normal diet, or replace the odd convenience meal, it could also substitute a person’s entire solid food diet. This was really revolutionary stuff. The other task we were faced with was educating the market; our campaign had to shock with the initial proposal, but also inspire a deeper understanding. We weren’t launching a fluffy spoof or fad product, there was substantial science, rigorous testing and long thought out research behind Huel. In order to be taken seriously, this had to be central to our communications, and the balance between the fun, sci-fi style shock factor and the real, nutritional science had to be perfectly struck. When devising our campaign, we knew that we wanted to get the message out far and wide. An announcement press release was considered the best way to do this; we could broadcast the announcement to all of our media contacts at once, from the niche sports press through to food, consumer and technology. Huel is a lifehack product, so we wanted to target a whole range of press far beyond those of traditional food supplements. In order to catch the journalists’ attention and showcase that Huel really was innovative, and not just in ‘PR speak’, we opted for a punchy headline that amped up the sci-fi, controversial angle and would get people talking straight away: ‘Who Needs Food? 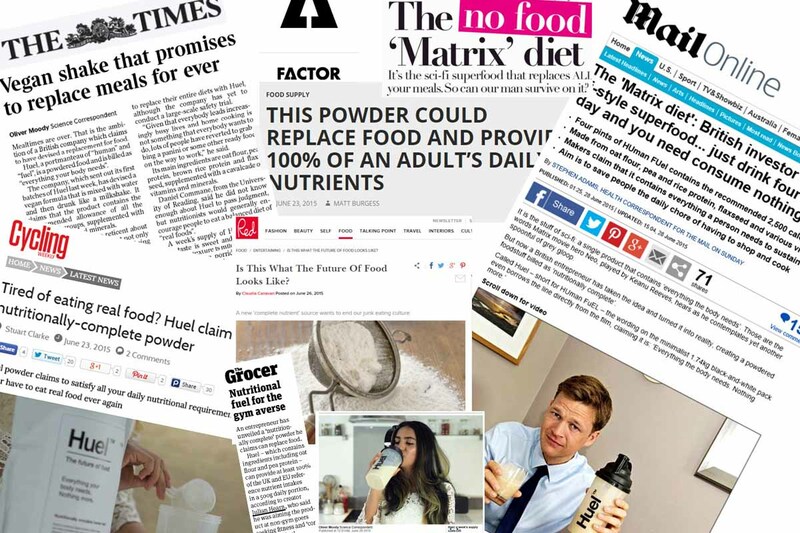 Nutritionally-Complete Powder Launches on UK Market’. We also decided that we would focus on case study activity but, even better, we wanted to invite journalists to be our guinea pigs! This meant that they would be able to see first-hand the benefits of using Huel, as well as the challenges, and get the chance to try out the Huel product and lifestyle themselves. We decided to offer key journalists a free week’s supply. Some journalists were more daring than others. In order to emphasise the whole nutrition of the powdered food, some were keen to go the whole hog and replace all of their meals with the shakes, while others just used it to replace the junk food they usually snatched while on the go or sustenance for long running sports events, such as ultra-marathon running. Another arm of our outreach was bloggers. The sports and fitness industry in particular has a huge blogger, vlogger and social media influencer presence; and the followers are generally very engaged. We decided that we would target this group too. As a start-up, the budget we had to play with wasn’t huge, and often this kind of promotion can be very expensive; but as the product would be of genuine interest, we saw uptake from this community without having to spare a penny towards it, aside from sending out a few samples. A massive lesson for any start up like this is that sampling played a pivotal part. Without the product to send out to the journalists, we would have struggled to gain the coverage we did; as everyone wants to be the first to try the new craze. This helped us to show journalists what we meant and give them a first-hand experience to use for their reviews and articles. Over just a couple of months, the launch campaign scored a whole host of coverage; from nationals like The Telegraph, Mail on Sunday and The Times to lifestyle titles such as Red and food and beverage publications like The Grocer, among many more. As a result of this rapid uptake and huge media interest, Huel became a hot commodity, selling out several times in the first month alone. Here is what Julian from Huel said, "We’ve been on TV a couple of times. We’ve been in most of the national newspapers in the UK, quite a few magazines as well, quite a few blogs. The PR worked for us in two ways. One, it worked in terms of traffic and sales. It also worked in terms of credibility."